Gorillas are also highly intelligent. They can learn sign language and know the meaning of more than 2,000 words. I didn’t even know there were 2,000 words. They live with their families, one of them is the leader and is in charge of up to 30 family members. They’re fascinated by their reflections and spend most of the day grooming each other. They’re basically the Kardashians of the animal kingdom. They’re also really good climbers. I once saw this documentary where a gorilla climbed the Empire State Building while holding a beautiful woman. I’m thinking of King Kong. But they are powerful. On average, gorillas are 6 times stronger than a human. That’s like the strength of 40 David Spades. But the thing that’s most amazing about gorillas is how compassionate they are. This is true. Gorillas will go out of their way to protect humans. There are cases where gorillas stop humans from walking into poacher’s traps. That’s how compassionate they are. Meanwhile, there are a lot of humans who honk their horns the second the light turns green. With only about 1,000 mountain gorillas left in the wild, we’re here to do everything we can to support them. Learn more about what The Ellen Fund is doing, or read on to learn more about the gorillas. With a little more than 1,000 mountain gorillas remaining in our planet, this is the only great ape in the world whose population is rising. These knuckle-walkers are the world’s largest living primates. Gorillas are an important part of the forest ecosystem, as they trim plants while they eat and constantly spread seeds around the forest. Did you know that African great apes–-that is the gorillas, orangutans, chimpanzees and bonobos–-are human’s closest living relatives? We are all part the same superfamily, the Hominidae. Like humans, gorillas can’t naturally swim, they have 10 fingers, 32 teeth, forward-looking eyes and sharp color vision. From habitat destruction to poaching and diseases, humans are gorillas biggest threat. Humans are the only ape species that is not threatened by extinction. Did you know we share 98% of our DNA and have the same blood type as gorillas? Wild gorillas live about 35 years and can live more in captivity. Colo, the first gorilla born in a zoo, died in 2017 after celebrating her 60th birthday. From screams, grunts, roars and growls...mountain gorillas use more than 20 different sounds to communicate. Mountain gorillas get visits from the doctor too! When a gorilla is spotted with signs of illness or injury, veterinarians can use medicines and vaccines that are administered using dart guns. The main structural difference between apes and monkeys is that apes don’t have tails. Founded to protect the gorillas, Volcanoes National Park in Rwanda was the first National Park ever created in Africa. Mountain gorillas usually stay at an elevation of approximately 7,000 to 14,000 feet in the mountains of central Africa. Virunga National Park, located in the Democratic Republic of Congo, and Bwindi Impenetrable National Park, in Uganda, are both World Heritage Sites and home to half of the world’s mountain gorillas. Gorilla tourism contributes significantly to gorilla conservation, as funds create jobs and bring benefits to local communities that live near gorillas. So, when you plan your next trip, don’t forget to visit the gorillas! Adult mountain gorillas can feast on 50 pounds of mainly leaves, roots, and stems every day, which weighs the equivalent to 40 basketballs. No wonder it takes them half their day to eat! Even though gorillas eat more than any other ape and have big round bellies, they are not fat. They have long intestines to process the large amounts of food they have to eat every day to get enough nutrients. Gorillas are nomads and can travel up to 1,000 meters a day in search of food. However, mountain gorillas travel much less than their cousins, the Lowland gorillas, for they don’t have to travel far to get a meal, they are surrounded by food in their habitat. While mountain gorillas are mainly herbivores, they occasionally snack on fruits and insects, especially ants and larvae. Eastern Lowland gorillas eat more fruit than their cousin, the mountain gorilla. Both gorillas are a subspecies of the Eastern gorilla. Even though most primates have a tree-living way of life, gorillas are terrestrial creatures that spend 95% of their time on the ground and occasionally climb trees for fun… just like us. Mountain gorillas like fresh beds! Every night each gorilla builds its own nest, except for baby gorillas, who sleep with their mothers until they’re about three. Gorillas live in family groups made up of 2 to 40 gorillas. Each group has one dominant male called a silverback who protects the troop, defines the group’s territory and routines, and has breeding rights to all adult females in the family. Once male gorillas reach sexual maturity, and the hair across their shoulders and down their back becomes greyish, they can fight other silverbacks to become the troop’s leader. 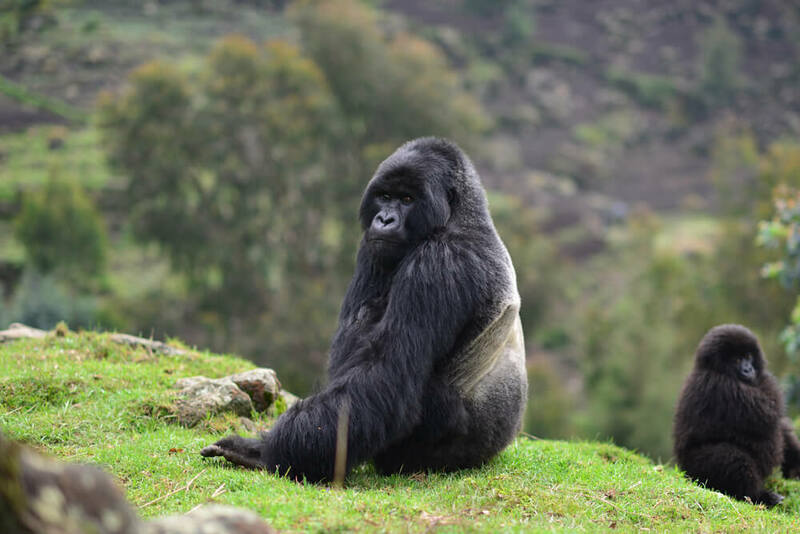 While mountain gorillas weigh less than five pounds when they are born, female gorillas can reach up to 200 pounds and silverbacks up to 450 pounds! Adult female mountain gorillas give birth to one baby every three to five years. And while twin gorillas are rare, a few twin babies have been spotted in the wild and in captivity. The thing that’s most amazing about gorillas is how compassionate they are. This is true. Gorillas will go out of their way to protect humans. There are cases where gorillas stop humans from walking into poacher’s traps. That’s how compassionate they are. Meanwhile, there are a lot of humans who honk their horns the second the light turns green. Step into Rwanda's beautiful Volcanoes National Park, where a community is uniting on the front lines of a region in crisis to protect endangered mountain gorillas. Sir David Attenborough takes you through Dian Fossey's journey of setting up the Karisoke Research Center in the park, where nearly a quarter of the world's 1000 gorillas remain. Sigourney Weaver played iconic conservationist Dian Fossey in "Gorillas in the Mist," and now that Ellen is preparing to build a research center for the Dian Fossey Gorilla Fund, the actress gave Ellen a few tips on how to talk to the majestic creatures. Ellen went on her dream vacation to Rwanda, where she's building a campus for mountain gorillas. Watch as she and Portia hike the jungle to meet these incredible creatures.